I didn’t want to run today. I haven’t really been out on a real run since the wedding in October. My failure to complete 30 Days of Running coupled with all of the travel from the wedding/honeymoon, then the stress and fatigue of moving in November. I just haven’t felt good enough to run. My wife and I have developed a tradition of running on Christmas and Thanksgiving. I didn’t run on Thanksgiving, but I did bike. 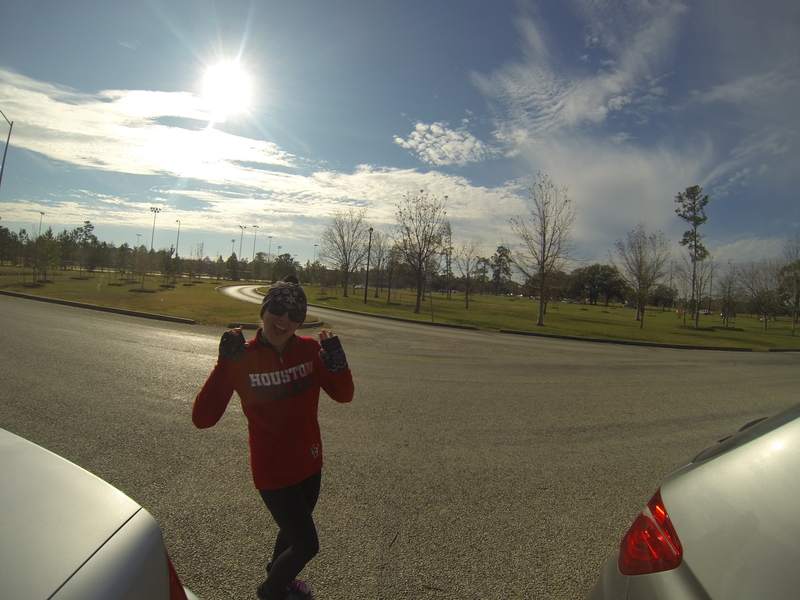 This Christmas I knew we’d be running and we did a decent cold and windy 5 mile run. That’s not a lot of miles for most of you “runners” but it’s a fair amount for me after 2 months of no running and dealing with pain. So it took a toll. I really didn’t want to run. My feet were sore, my quads very sore and I just didn’t feel like it. I lobbied heavily for No-Run, she almost bought in but ultimately didn’t and we left for a run. The Memorial Park Loop was busy, people everywhere. As we started our run my feet settled in pretty quick and the pain went away. It was a nippy 34 degrees but the sun was out so it was nice, just the way I like it. As we passed more and more people I started feeling better and could feel my body settle into a solid stride. For once, I was setting the pace on this run (Merelyn usually sets the pace as I struggle to keep up). The more people I passed the more people I wanted to pass. I started getting the race mentality and looking for stronger runners along the trail that I could chase down and pass. Soon, we were passing nearly everyone and my stride felt easy and natural and I pushed it on. I didn’t make any new PRs or break any records but it was a good run and, more importantly, it felt good. I’m glad I ran today. We had talked about this for a while. I had heard, and confirmed, that the Houston REI rented out kayaks. So, once I got a few extra bucks in my pocket, I made arrangements for us to rent a couple of kayaks from REI and paddle part of the Buffalo Bayou. 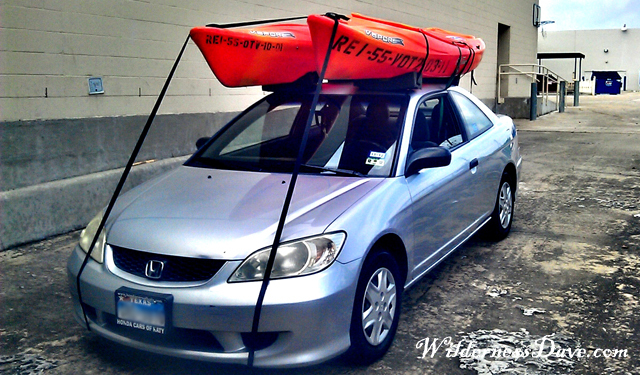 The look on the face of the guy at REI who saw us pull up in a 2004 Honda Civic to pick up our kayaks was priceless. With some help, we got them secured to the roof of the car. He found the spectacle entertaining enough that he insisted on getting a picture. The put-in for Section 5 of the Buffalo Bayou was less than a mile away so I was not all that worried about the kayaks. We drove out of the parking lot of the Houston REI and up a side street through a beautiful neighborhood to Briar Bend Park. Access to the Bayou at Briar Bend is behind the park. Access was pretty easy, even toting heavy 10ft plastic recreational kayaks. The beasts we rented were not like the sleek, light sport kayaks I’m used to. These were the heavy, lumbering Old Town Vapor 10 kayaks. Short, wide and made of heavy plastic, these boats were nearly 50lbs without any gear and made to take a beating. I would consider them a pretty good beginners kayak, with a relatively flat bottom and very wide mid-section they were very stable. I’m not sure if I could have tipped it over if I tried. Our plan for the day had options: We initially thought we would paddle downstream from Section 4 (Briar Bend Park) to the put in for Section 5 (Woodway Memorial Park) and if it didn’t take too long we would just paddle back upstream to Briar Bend. The Bayou is a pretty slow moving water way and paddling upstream would not be difficult. Plus, we did not schedule a shuttle or plan for leaving a vehicle at a designated take-out. Plan B was to drift on past Woodway Memorial on to the other side of Memorial Park and perhaps further if we kept up a fast pace. We expected to be out for about 4 hours. Without a shuttle, we had decided we’d just pull off the bayou wherever we wanted and grab a cab to take one of us back to our car while the other waited with the kayaks. So, with options for the day, we carried our giant hogs down to the water and prepared ourselves for an afternoon of paddling. Always bring more food than you need. We were running a little late that morning getting started, so we did not get the chance to run by the store to stock up on snacks for the afternoon. I had packed water, almonds and a couple of apples. Turns out almonds and a couple of apples are not enough food for a 5+ hour paddling trip. Make sure to pack enough food and water to last longer than you anticipate being gone. The put-in at Briar Bend is nice. It’s tree covered and an easy walk to the water’s edge. The Bayou is very narrow here so this is one of the few places with an actual riffle of fast moving water. I set up Merelyn at the lower end of the rapid so she didn’t have to push-off in to a fast current and then set myself up a little higher (just for fun). Once on the water, we got ourselves settled in to our boats and began our paddle trip. The water on the Bayou is slow and murky, exactly what I expected from a Bayou. It is definitely a leisurely paddling trip, we kept up a decent pace but it was still plenty slow enough to enjoy some of the more scenic turns. Old growth trees, hanging their heavy, gnarled limbs over the water as if guarding the muddy shoreline. Vines draping low as they weave between the tree branches added to the dense vegetation. The Buffalo Bayou winds it’s way through the heart of Houston. So, from time to time, the trees open up to reveal some building or another peaking through the greenery. Much of the Bayou is adjacent to high-end private estates or golf communities so the architecture seen from the water can be impressive. As we paddled along, learning how to handle the new boats, we started to see the signs of wildlife along the waterway. Often, something would slip in to the murky water before we could get a good look at what it was. But we did see snakes, turtles and fish as well as a variety of birds. Know the skill level of your party. Little did I know, Merelyn had virtually no experience in a kayak. I’ve seen her use the sit-on kayaks on trips to Mexico and she handles the paddle with confidence so I never suspected her lack of experience. On most whitewater trips, I don’t assume anyone has experience unless I’ve paddled with them before. I would normally run through a quick “how-to” and talk about fitting the kayak, posture, paddle grip and technique. Along the way, once I realized she was struggling with certain parts of paddling, we did a quick lesson on steering, stopping, correcting, etc. It’s important to know the skill level of your adventure partner and, if you are the one lacking experience in a particular skill, you should not feel embarrassed or afraid to ask for help. We reached our first take-out option pretty quickly. We stopped for a minute to discuss our options: paddle back, or keep on going? Ultimately we chose to keep on going under the assumption that the next leg would take us about the same amount of time as Section 5. We had a quick snack of some almonds and I ate one of the apples (Merelyn was afraid they were too old and not good anymore). The next section proved to be much more technical than the first. The path of the Bayou became more twisted and littered with debris. Consequently, the water moved even slower forcing us to work harder. We both had assumed that as we neared the Memorial Park area, there would be places where we could get out of the Bayou prematurely if we were getting tired…this was not the case. The shoreline continued to be a thick, matted jungle of shrubs, vines and tree-limbs. And where it wasn’t so heavily vegetated, the shore was either too steep to ascend or was private property and clearly not welcome to trespassers. We paddled on. The map we had picked up from REI showed the Bayou Paddle Trail and the areas where access was available. However, the map was remarkably small and lacking in detail and many of the supposed access points were not marked. Without knowing exactly how far we had to go, or how long it would take us, uncertainty began to weigh on my hungry companion (“almonds are NOT food”). The Bayou was loosing it’s charm. 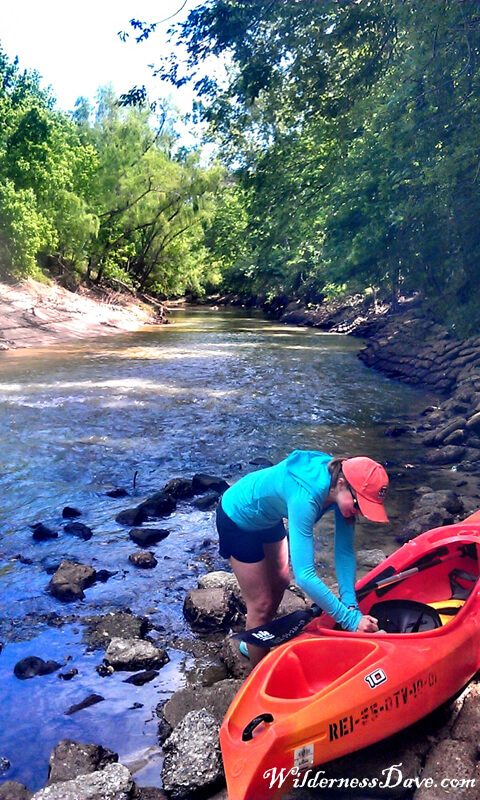 The shear volume of litter and trash that choke the waterway was disturbing to both of us. Some parts were worse than others but it seems that the Bayou has been the personal dumping ground for the population of Houston. Know your equipment. The ability to rent expensive equipment like rafts and kayaks is great, it grants you the opportunity to participate in an activity that you otherwise couldn’t afford. The problem is, most times you are renting equipment you may have never used and may never use again. In some cases, this can be a deadly problem. Luckily, in our case, I had experience with several different styles of kayaks and once I knew there was an issue I could address it. Again, don’t be afraid to ask about your equipment. Let the outfitter know that you want them to walk you through the features of the equipment you are renting. You’re paying to use it, get the most out of it by knowing what it can do. Shortly before we came to the Hogg Bird Sanctuary, Merelyn and I stopped and she complained about not being able to find a comfortable position in the kayak. It was wearing her down, constantly having to shift around to find a stable position. This is when we realized that she had never found the foot braces. They had been pushed so far forward by the last person to use the kayak that she didn’t even know they were there. Once we adjusted them so that she could reach them, and fine tuned them until she was comfortable, everything changed. Suddenly, she was comfortable in the kayak, had better posture and a stronger stroke. She was re-energized and anxious to reach familiar ground. We never did see the exit point at the Hogg Bird Sanctuary (beginning of Section 7) and looking at the map, decided we’d shoot for a take-out at Eleanor Tensley Park (just short of Section 8). The Bayou straightens out after the Hogg Bird Sanctuary and we were able to make good time, especially with Merelyn’s new-found mastery of her kayak. The cruised along at a good pace, the bayou opened up at the shore and we no longer felt “trapped”. We pushed to a spot along Eleanor Tensley Park where we could pull the kayaks out and wash them off a little before dragging them, and our gear, up the hill to the parking lot. Always have an exit strategy. It’s always good to have a plan, and a backup plan. But makes sure your plans are well thought out and you are prepared for them. As much as “eh, we’ll figure it out when we get there” can make for a great story and adventure, it can also create pain, misery and resentment. It’s best to have a clear, well designed plan for concluding your excursions. One that everyone is informed about and agrees with. It was getting late, so I called a cab company (the only one in town) and put Plan B into action. The answering service for the cab company hung up on me when I failed to find a physical street address for the park. Turns out, this park has NO listed street address. It has no address on any of the signage either, nor the website, nor the map. This, as we were to find, makes the park invisible to cab drivers. I looked up an address (not even sure it was a proper address) online for the park, but without the numbers displayed somewhere we were gonna have problems. I finally convinced the dispatcher to send a cab our way. I watched, who I believe was our cabby, drive by the park 3 times before I got a phone call from him angrily asking where I was. I was berated, in broken English, for sending this guy on a wild-goose chase to an address that “does not exist!”. I watched him drive by two more times while I had him on the phone and could not get him to understand that the giant green grassy area with the trees was THE PARK! I finally waved down the irate cab driver who was crawling along the roadside, getting honked at and I’m sure receiving various unpleasant gestures, and had him pull in to the parking lot. I sent poor Merelyn with this inconsolable, and incomprehensible, man who would not stop insisting that the park did not exist. As they left, I pulled the kayaks the rest of the way up the hill, into the shade, and crawled in to one (hammock style) to take a nap. It’s all about attitude. Even in some of the most stressful and crazy situations, laughter and calm sets everyone at ease. Life is too serious to take seriously. When things start to go wrong, they can be made worse by arguing, complaining and fighting with others about the situation. Or, when things turn for the worse, you can accept it, go with the flow, have a sense of humor and unite to meet the challenge head on. Cooler heads prevail. Some time later, Merelyn arrived in her car. She had brought food (hers was already consumed, I’m sure within seconds of it being passed through the drive-thru window). She filled me in on the antics of the poor, distressed cab driver who clearly had signed on for more than he could handle that evening. He really could not let go of the fact that the park address did not exist…it could also be that the address issue was the only thing Merelyn could understand between his thick accent, propensity for leaning on the horn and apparent inability to navigate traffic. We loaded up our gear and strapped the kayaks to the top of the car again and headed home. We ended the day sunburned, tired and hungry but we laughed all the way home (mostly at the cabby). It was an adventure and, like all good adventures, it was more than we had bargained for. In the end, we had a fun day together and a story to tell. What else really matters?